No, not the TV show, (am I the only person in the world not to have seen it? 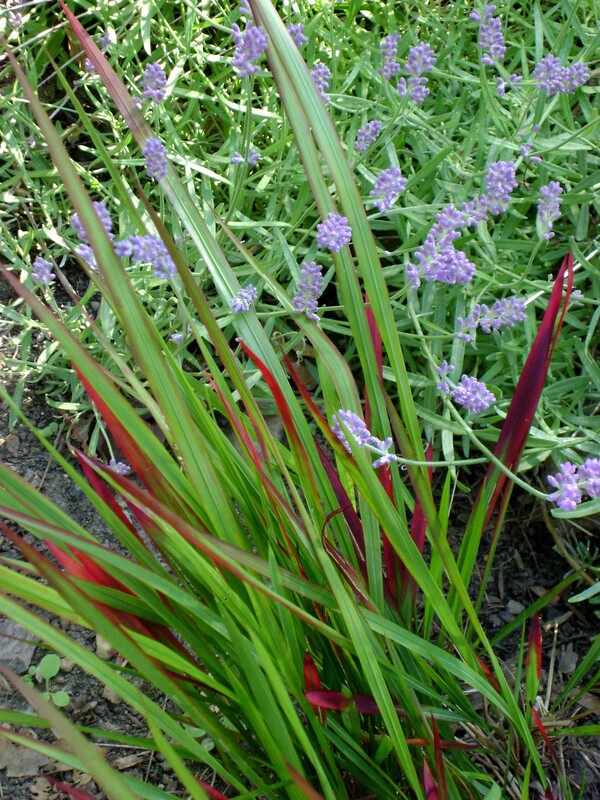 ), but Imperator cylindrica ‘Red Baron’ or Japanese Blood grass. It is the star of the garden when it starts showing its true colours, but especially as we head into fall, the red just sets of everything. Like my new Japanese anemone ‘Pink Saucer”. Love it with purple like this lavender. 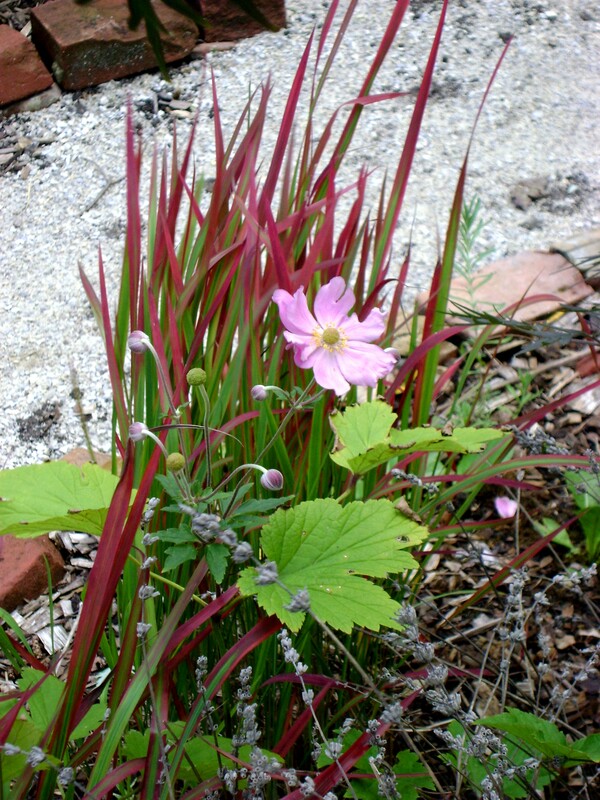 Japanese Blood Grass emerges from the ground green with red tips, but the colour becomes stronger and more intense in late summer and into autumn. 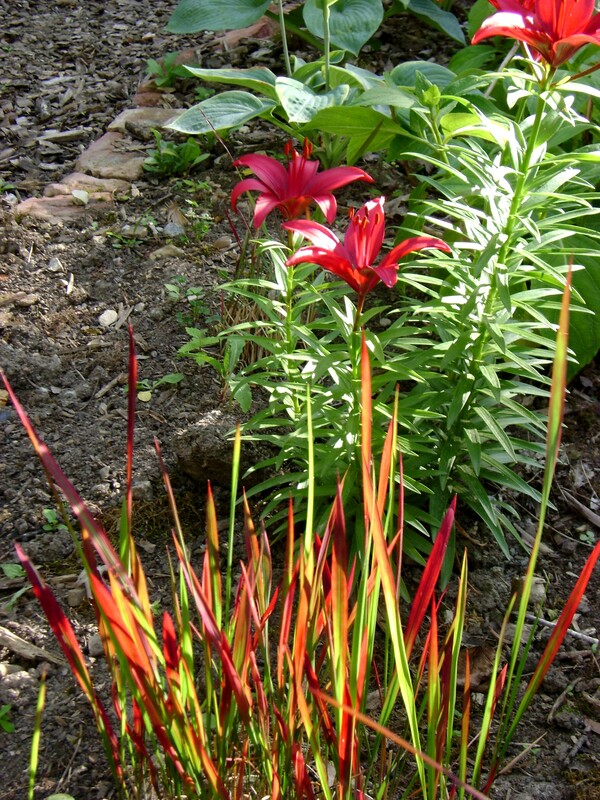 But I especially love it (does Ian know I spread my love around like this, lol), when it is backlit by the setting sun, seen here with red lilies. 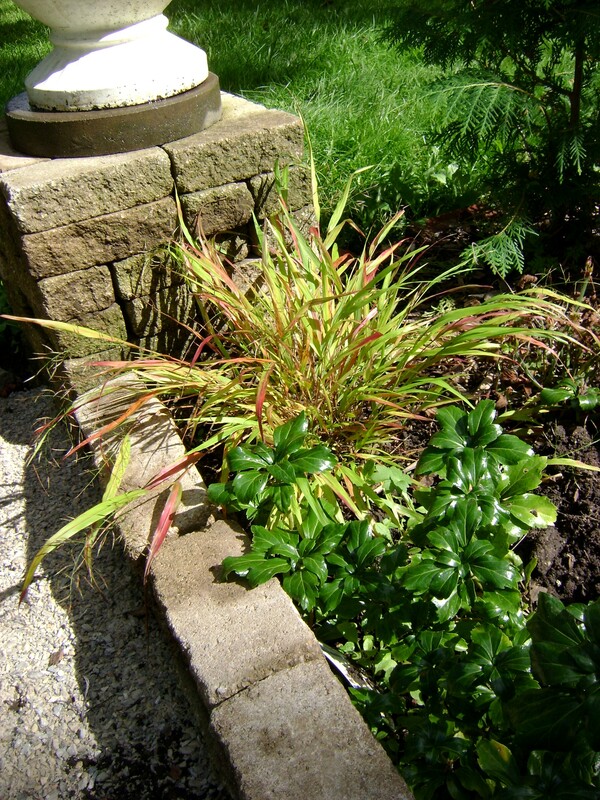 Hardy to Zone 5, it grows in shade to part sun, but I think that you need a bit of sun, just so you can see it glowing. Love it! Although with apologies to her. For some reason Stings song ‘Roxanne’ keeps coming into my mind every time I look at her, and I have actually called her Roxanne a couple of time by accident. She came into my life, a 6 inch bundle of joy with an impeccable pedigree. 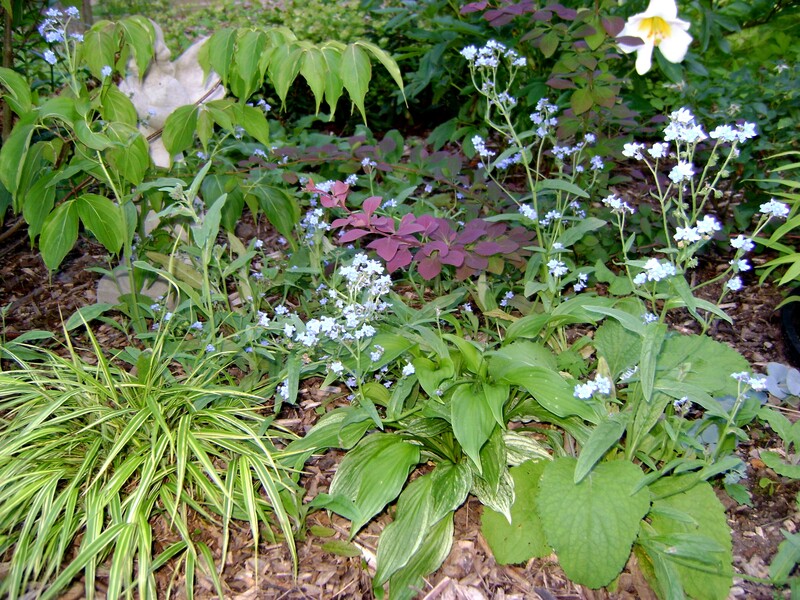 After all the Perennial Plant Association had named her the perennial plant of the year for 2008. How could I go wrong adopting this little cutie, and for a long hot summer we were happy. Our problems started the following July. Where last year she was happy and flowered her little heart out, this year she sat sulking, and refusing to move. The final straw came when she started blushing red, this isn’t fall, she had no excuse for this kind of behaviour. Look, there she sits, sulking behind her new brother ‘Beni Kaze’, was she jealous at the attention paid to the new arrival? Did she think he was more beautiful than her? Does she not know that a mother loves all her children equally. I wondered if she was lonely for more of her own kind, and when a garden centre reduced her siblings to $1.00 each, (yes that is right, $1.00), I took the opportunity to bring them home, all 11 of them, Angelina Jolie has nothing on me, lol. They were a bit scruffy, and a lot of people could not see past their outward appearance to their beautiful heart. Hopefully my Rozanne will perk up now that her brothers and sisters have arrived! That magical hour, when everything (including me) looks so much better in the garden, no harsh glare, just flattering shadows. So far, I am pretty happy with the way this section of the garden has turned out, however there is always room for improvement. 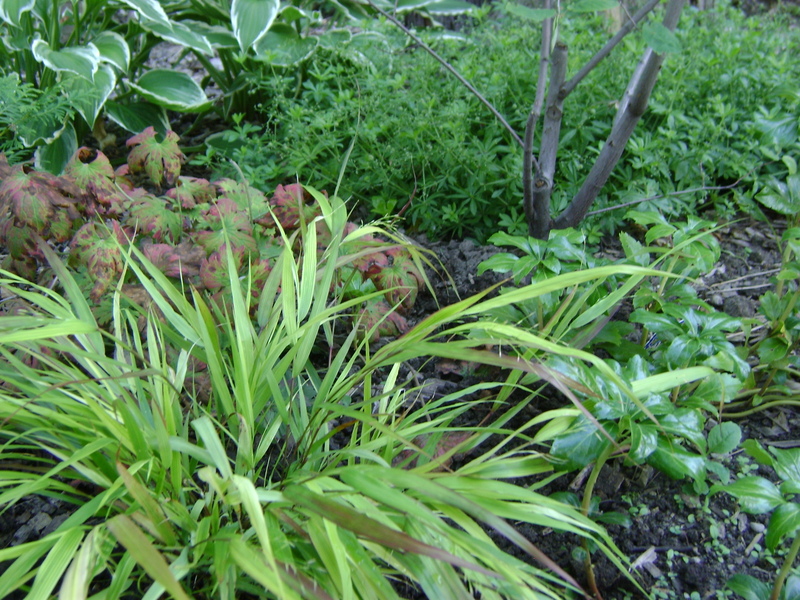 So far, I have Hakonechloa macro ‘Albo striata’, Hosta ‘White Feather’, Berberis ‘Royal Cloak’, a mini variegated bamboo, name unknown (but planted in a pot, just in case), Regale lily, Sedum sieboldii, self seeded foxglove and an Anchusa, also unknown variety. I hope that I never lose my interest in learning. I think that I could be a perpetual student, at least in subjects I am interested in, lol. I love, love taking garden courses. I have taken quite a few over the years, but my favourite teacher has to be Marion Jarvie. 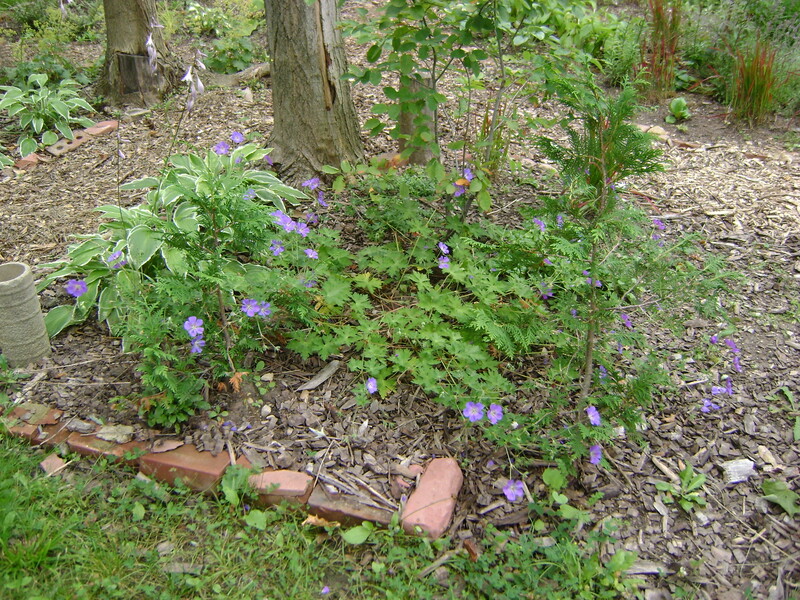 Every course I have taken with her, I have come out a better gardener. 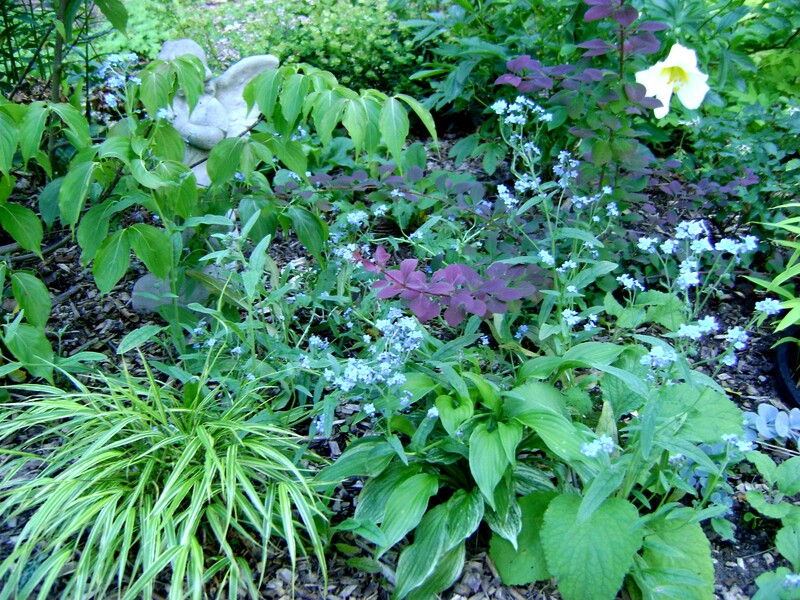 She opened my mind to using trees and shrubs, the way other gardeners use perennials. 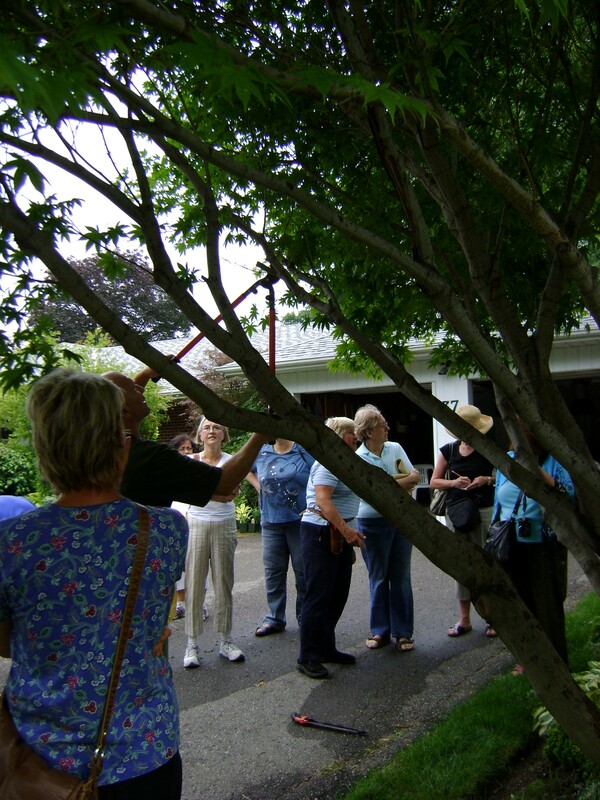 I have taken lots of courses with her, but on Wednesday it was pruning, and it was in her own garden. This was so much better than taking it at the Toronto Botanical Gardens, I am always looking for an excuse to get to see Marions garden. It was also a lot of fun that my friend Barry Parker was there as well. (We actually went to a garden centre after for a spot of shopping). 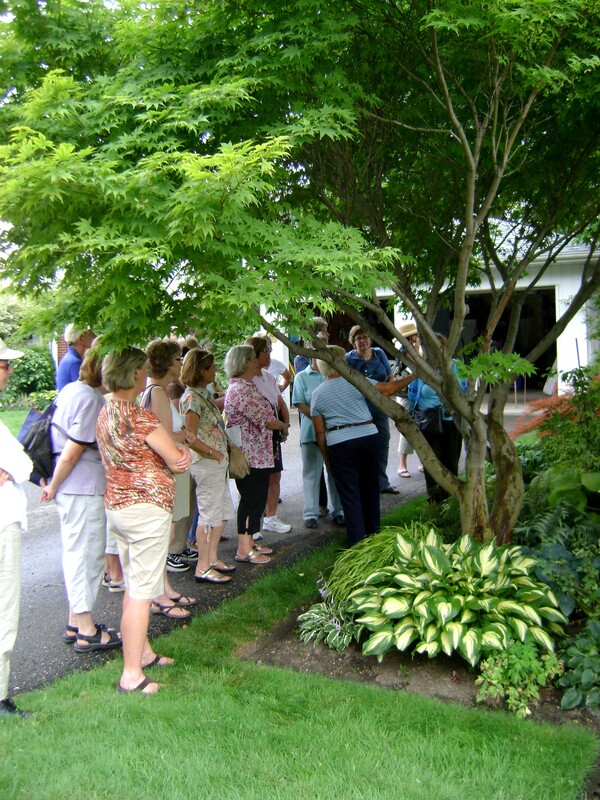 We started at the road side with a Japanese Maple that she had planted 25 years ago. It was one of the first trees that she planted on her property and it is huge. 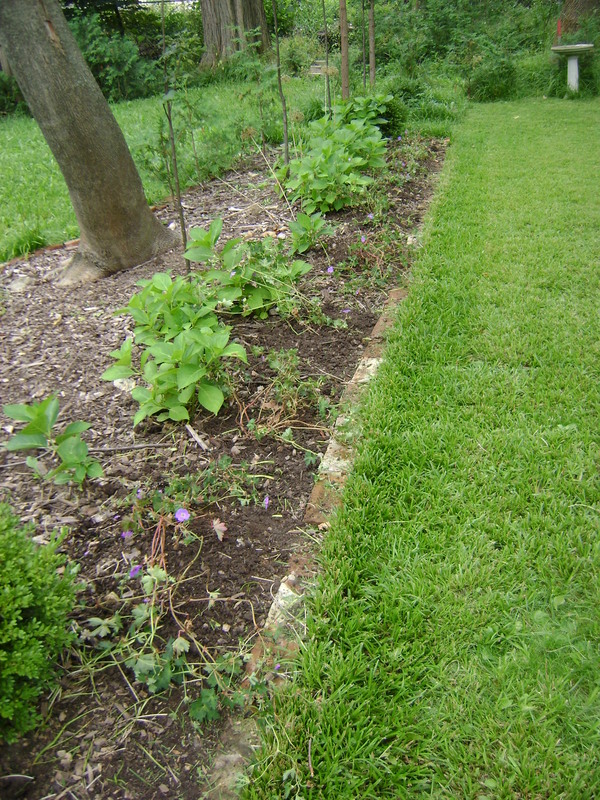 Now it is overhanging the driveway a bit too much and needs pruned back. 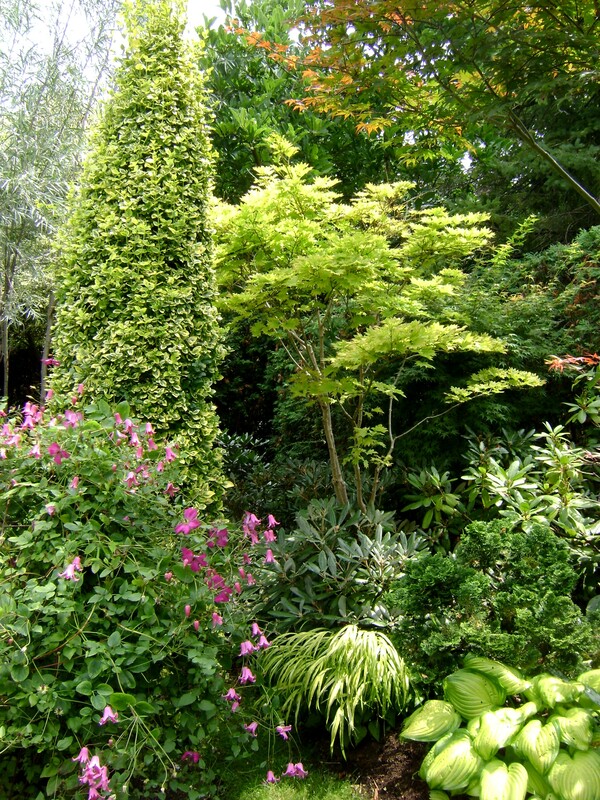 You have to cut back a tree or shrub gradually, do not try to shape it all in one year. 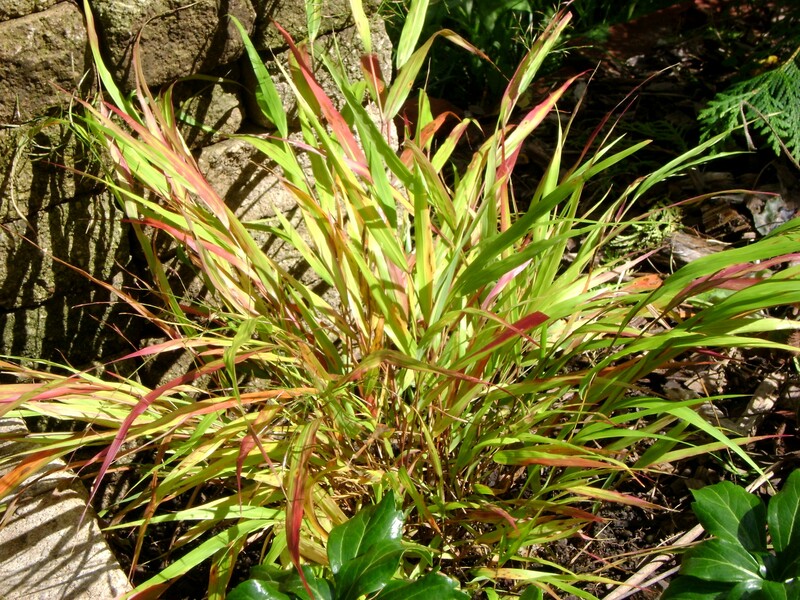 It is best to prune it over 2 or 3 years and give the plant time to acclimatize. Marion had a friend, David Leeman there to do the heavy work. He is making sure he knows exactly what branch she wants removed, after all you can’t glue it back on. and then getting out the saw. 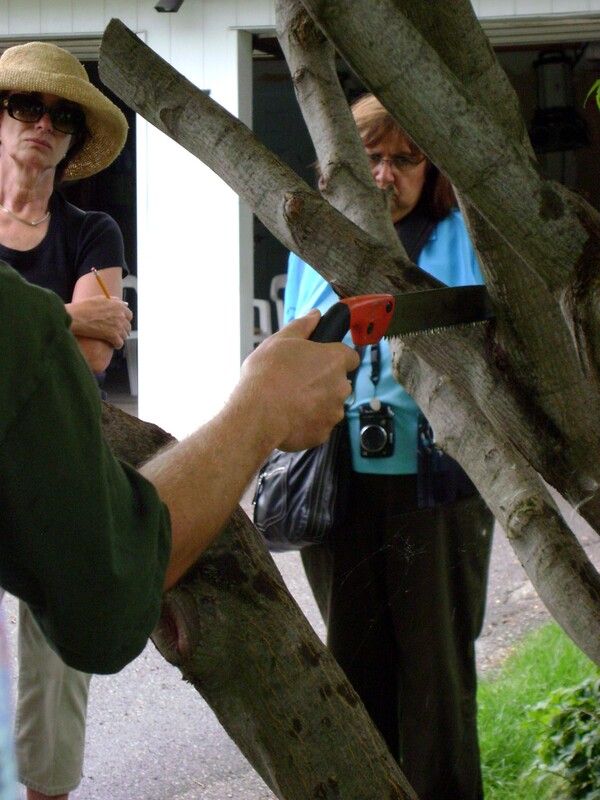 He used the saw in two spots, first reducing the length of the branch. This is so, when he cuts it close to the trunk, it weight of it does not tear the bark. You also want to cut it close to the trunk, but not too close, it is a fine line. 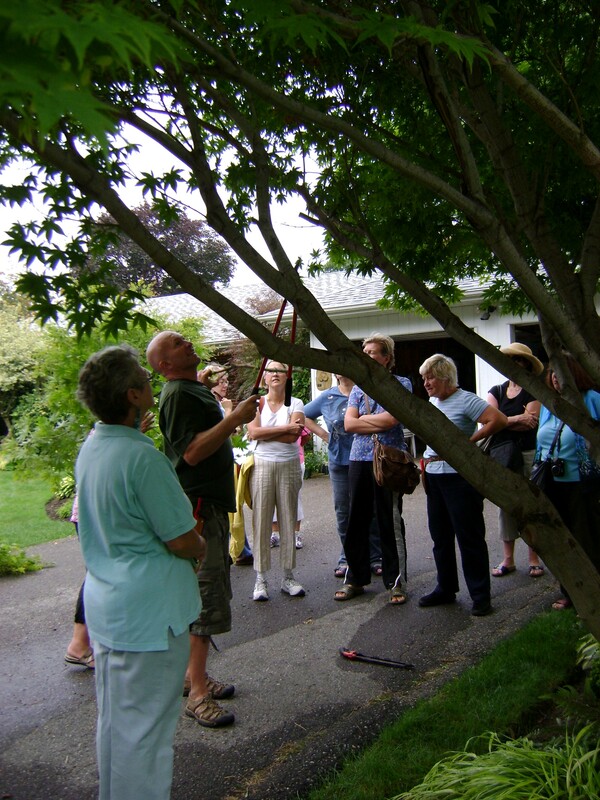 Marion said that you can prune a Japanese Maple any time, except when the days are above freezing, and the nights are below. This is the classic ‘maple syrup’ time, the sap starts to flow , you do not want the tree to ‘bleed’. I should have taken and after picture, but you really couldn’t see the difference, the mark of a good pruner. 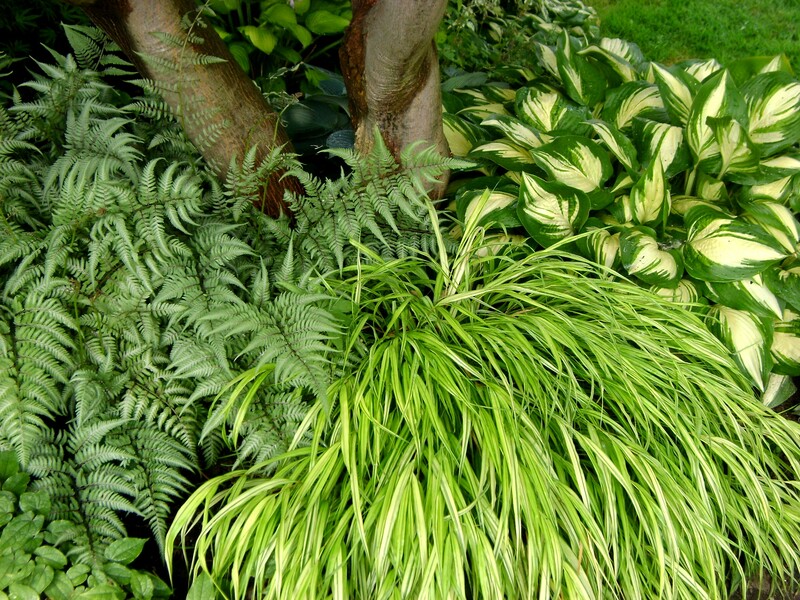 Look at the lovely underplanting of the Japanese maple, Athyrium ‘Ghost’, Hakonechloa macra ‘Aureola’ and a variegated hosta, I could copy this look. 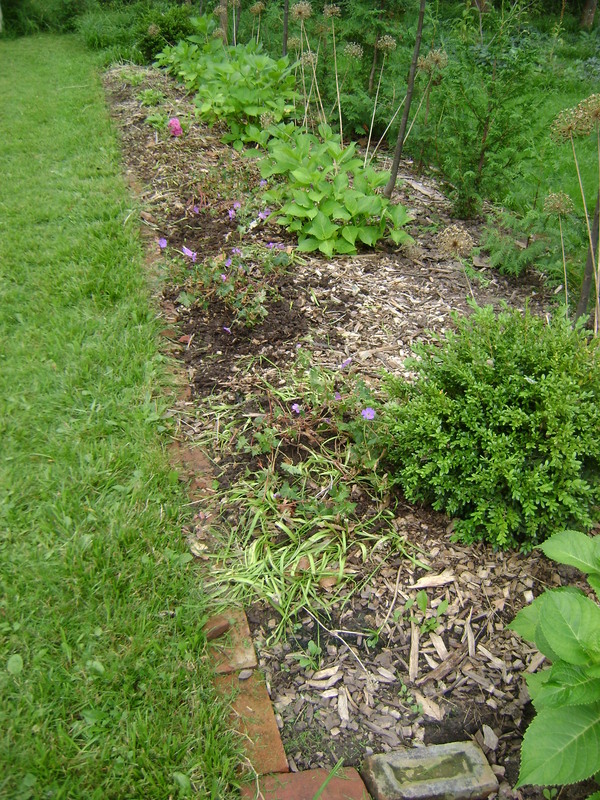 After the course was over, I took a look around Marion’s garden. 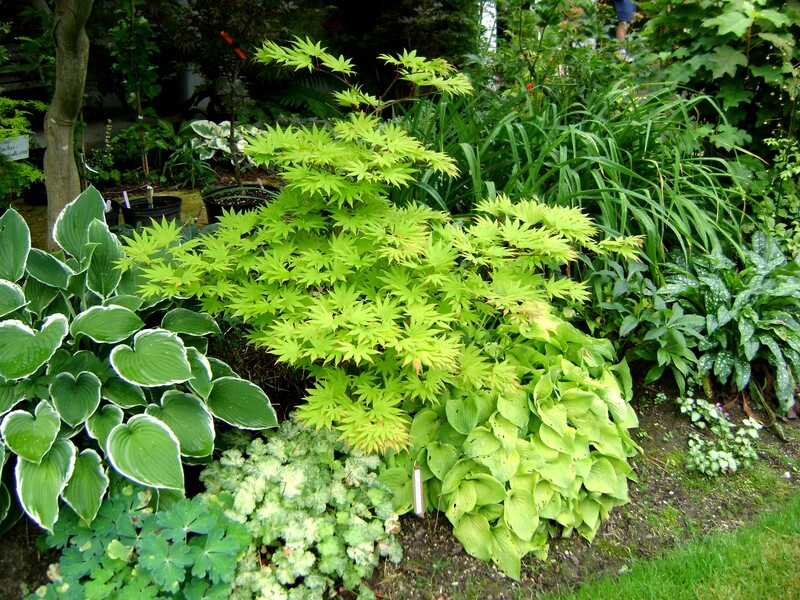 This maple is on my wish list for next year, it is Acer shirasawanum ‘Aureum’, or the Full Moon Maple. 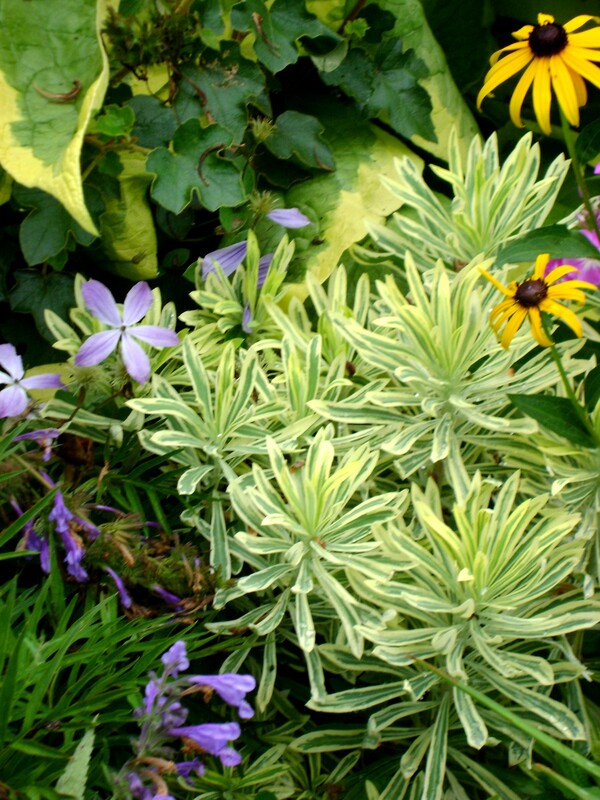 I love euphorbias, there are a lot of variegated ones out there now, like ‘Ascot Rainbow’, or ‘Silver Swan’. 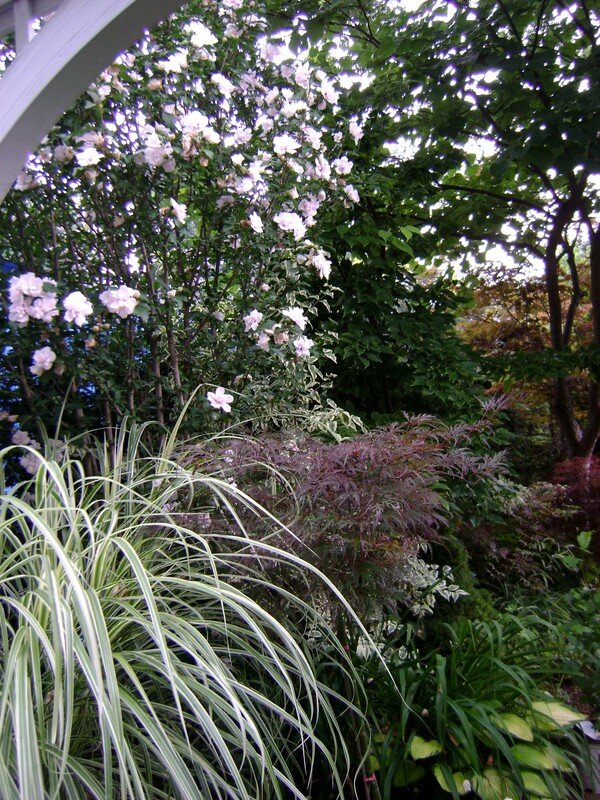 Under her arbour, a pale pink, double rose of sharon (Hibiscus syriacus), a red Japanese maple and a lovely variegated grass. I could duplicate this as well. Here is something else I would like to try, if I could only get Ian to go for it. 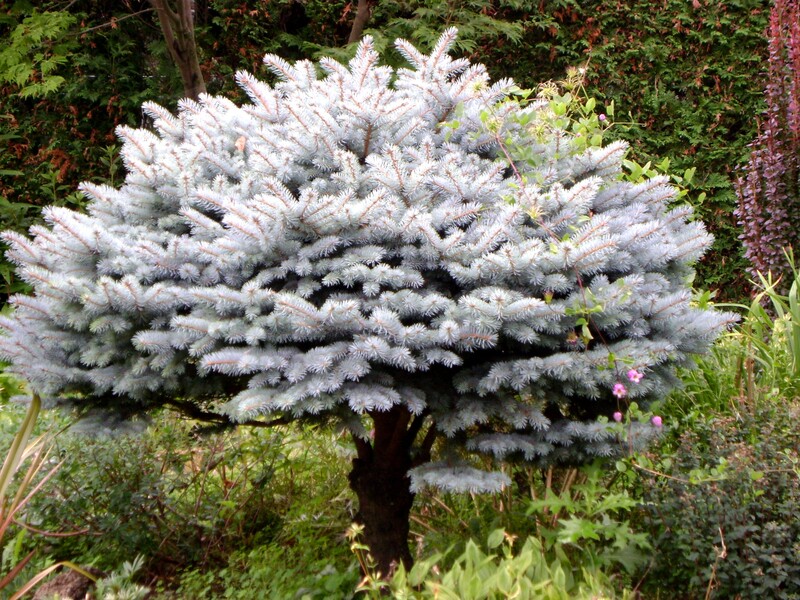 She topped her blue spruce, and has pruned it well. 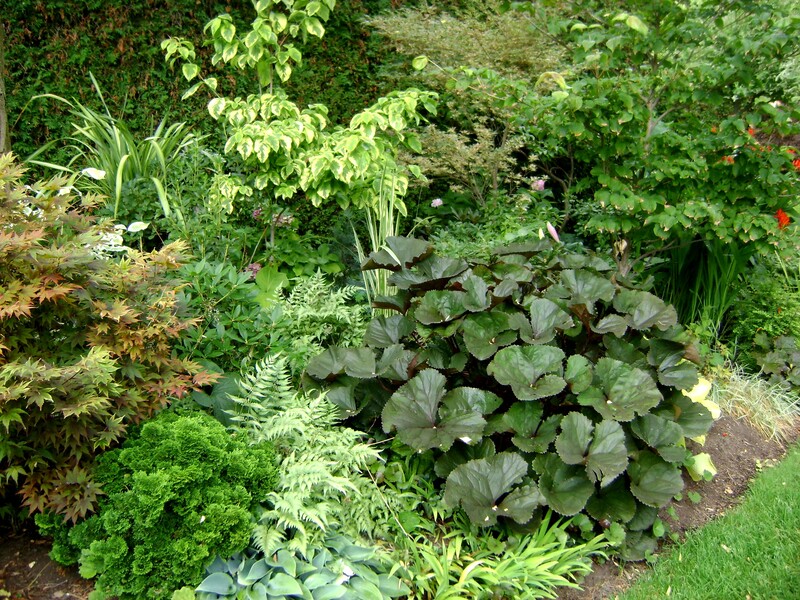 Between her and Barry, I can’t decide whose ligularia is lovelier, hopefully mine will be nice as well one day. 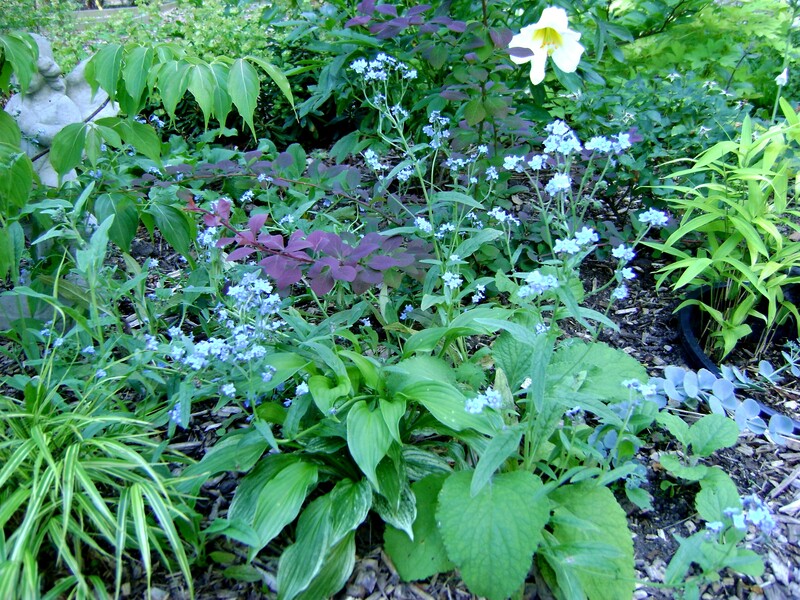 I love this small clematis scrambling through the perennials, it is called ‘Rooguchi’, 2 o’s on the tag, but when I googled it, there was only one o. 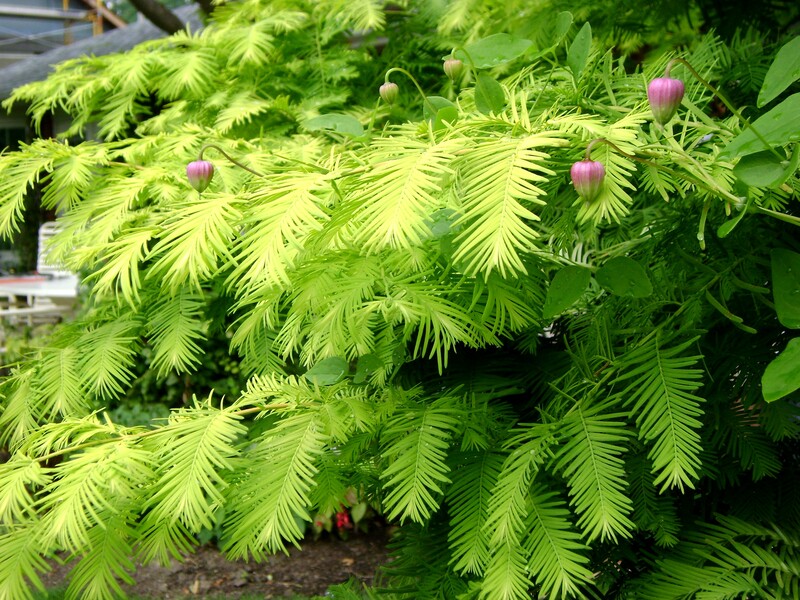 A golden dawn redwood or Metasequoia, is also being pruned. She is keeping it to roughly 10 feet tall, cut off the leader 2 years ago. 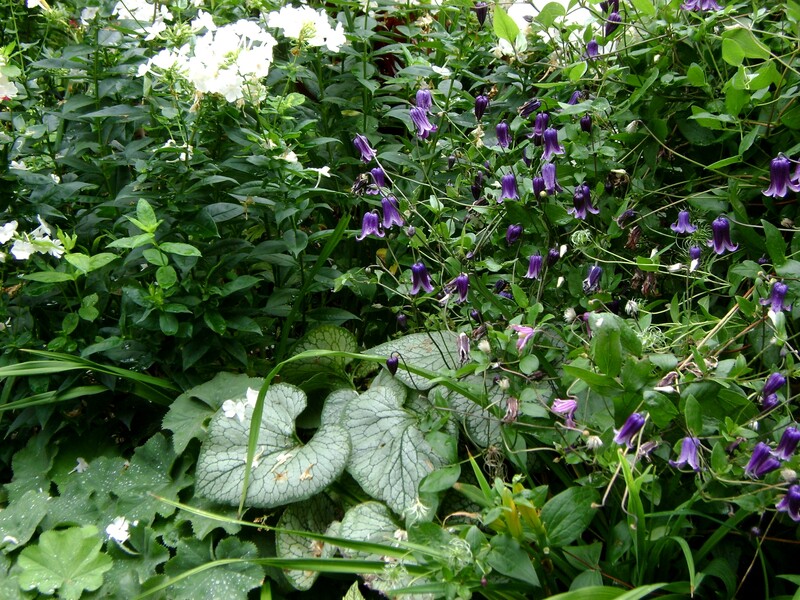 It also has a lovely clematis scrambling through it. Lastly, a great example of pruning. 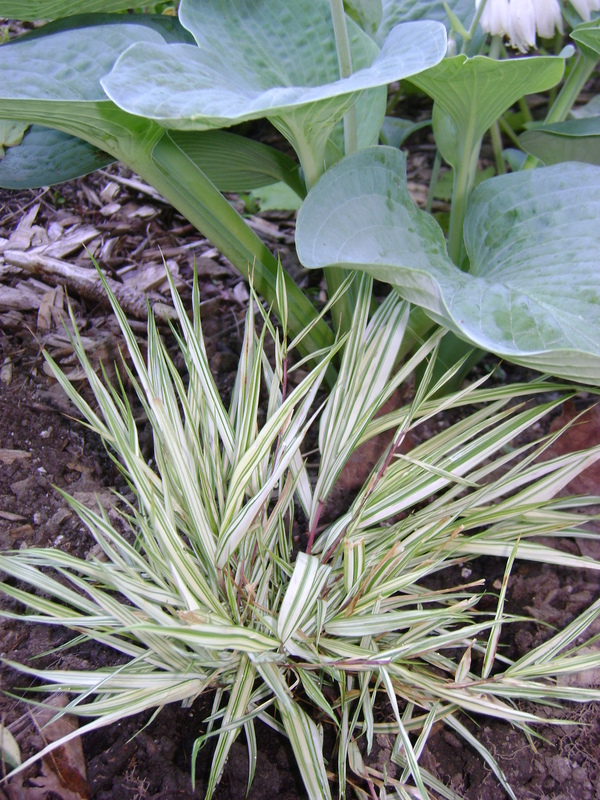 This is a golden euonymous. It has been trained on a pole and kept clipped in a columnar fashion. I could copy that too!